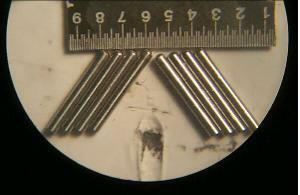 Thermocouples, wires, light bulb filaments, and similar products require low amperage and short duration welds. For small welds such as these, a micro-arc process such as micro-TIG or micro-Plasma are the arc welding options and either process will work for many applications. For those applications requiring short duration welds (weld times less than 0.1 seconds), Plasma welding is the process of choice. The Plasma arc weld process keeps a pilot arc established inside the welding torch and transfers it to the workpiece for each weld. This gives the Plasma system ability to gently and consistently start an arc to the tip of wires or other small components and make repeatable welds with very short weld time periods (as short as 0.005 seconds) In addition, the arc tends to transfer exactly to where it is aimed and is inherently more stable in these applications. Close tolerance balls on wire endings can be created by imposing a welding arc on the wire for a controlled period of time. 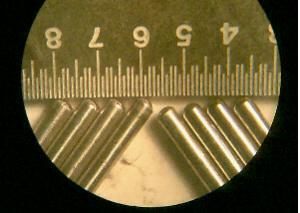 Small diameter tubes can be closed to a perfect hemisphere in a similar fashion. Rod and wire end rounding, part end closure, spot welding to seal a swaged part and many other applications form a sector of manufacturing where precision welding is used to create a specific geometry required. This picture shows how adjusting the welding parameters can change the ball shape and size. Once a ball shape and size have been chosen, the system provides consistent weld results. 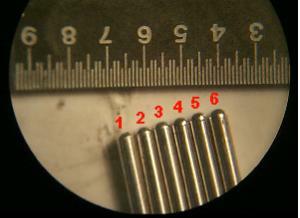 The four electrodes on the left are welded to create a flat ball. The four on the right produce a more rounded ball. Close up of the picture above.